Grandmaster S P Sethuraman played out an easy draw as white against five-time world champion Viswanathan Anand in the seventh round of Isle of Man International Chess tournament in Isle of Man, UK, on Saturday. Both Anand and Sethuraman inched themselves up to five points out of a possible seven and shared the joint eighth spot after a rather dull day that witnessed several draws on the top tables. Michael Adams of England took advantage of this draw-melee to join the six overnight leaders on 5.5 points defeating erstwhile joint leader Abhijeet Gupta. For Gupta it was the second loss in a row after what looked like a splendid display till the half way stage. Left on 4.5 points with two rounds to come, the Indian needs many things to click in his favour. For the record, the overnight leaders played out a draw amongst themselves. Franchman Maxime Vachier-Lagrave split the point with Arkadij Naiditsch of Azerbaijan, Wang Hao of China got the same result against Radoslav Wojtaszek of Poland while the all-American duel between Hikaru Nakamura and Jeffery Xiong also ended peacefully. Apart from these six, Adams is now in forefront on 5.5 points. Sethuraman was in control with white against Anand out of an English opening game. The middle game arrived with a hedgehog pawn structure wherein the pieces changed hands at regular intervals. The players soon reached a minor piece endgame where the draw was a just result. Gupta played the French defense and faced a sideline in Winawer variation. The position was equal for quite sometime and Adams got an advantage once Gupta erred and allowed pawn weaknesses in his camp. In the endgame, Adams picked out one pawn and then displayed some fine technique to romp home. Amongst the norm-seeker Indians, R Vaishali continued with her super form and held compatriot Grandmaster Vaibhav Suri to a draw. With four points in her bag from seven games, Vaishali is almost assured of an International Master norm. 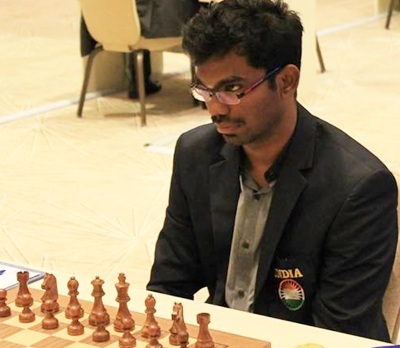 Important and Indian results round 7 (Indians unless specified): Maxime Vachier-Lagrave (Fra, 5.5) drew with Arkadij Naiditsch (Aze, 5.5); Hikaru Nakamura (Usa, 5.5) drew with Xiong Jeffery (Usa, 5.5); Wang Hao (Chn, 5.5) drew with Radoslav Wojtaszek (Pol, 5.5); Vladislav Artemiev (Rus, 5) drew with Vladimir Kramnik (Rus, 5); S P Sethuraman (5) drew with V Anand (5); Michael Adams (Eng, 5.5) beat Abhijeet Gupta (4.5); D Gukesh (4.5) drew with Hrant Melkumyan (Arm, 4.5); Vidit Santosh Gujrathi (4.5) beat C R G Krishna (3.5); Swapnil S. Dhopade(3.5) lost to Pavel Eljanov (Ukr, 4.5); Surya Shekhar Ganguly (4.5) beat Harsha Bharathakoti (3.5); Sundararajan Kidambi (4.5) beat Gregory Kaidanov (Usa, 3.5); R Praggnanandhaa (4.5) beat S Ravi Teja (3.5); Vaibhav Suri (3.5) drew with R Vaishali (4); Tania Sachdev (3.5) drew with Abhimanyu Puranik (3.5); M Shyam Sundar (3.5) drew with Raja Harshit (3.5).